Captain Jaromir Jagr didn't show up to work last night, though he played most of the game. 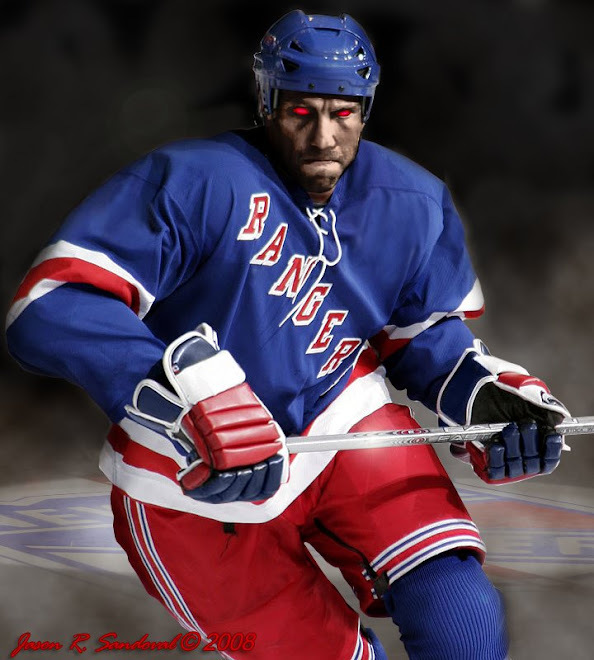 Our Czech wonder was slow moving, turned over possession a couple of times for no reason and is solely responsible for the strained, tired and beaten-up looking Ranger squad that played The Garden last night. "SHOOT THE DAMN PUCK!!!!" In section 118, my neighborly Blueshirt fans were screaming "Let's Go Islanders" hoping that the reverse pyschology would boost the Ranger's scoring opportunities to no avail. The New York Rangers lost 2-1 to the New York Islanders...AGAIN. We haven't beat this team this season, now 0-3. The Dark Ranger attended the frustrating game at The Garden last night and marveled at how we again morphed into that defensive-only minded team we lived through the first 10 games. Didn't the Rangers begin scoring goals drawing 9 out of 10 wins when coach Tom Renney mandated that every player WILL shoot to the net...often? With Shanny planted in front of the net, weren't we supposed to shoot and knock in the rebounds? Our European perimeter game burden reappeared again last night -- thanks Jags - and we waited for the perfect goals that never came. One thing is for sure this season, you never know what team is going to show up on any given night - we are not a middle-ground team, the one where you walk away from the loss feeling like they played a great game and were simply outplayed. 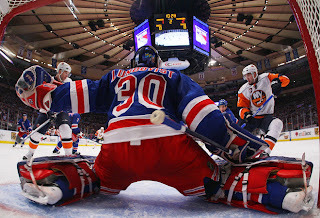 The Blueshirts either control and shoot the puck or they play mediocre, shaky defense without goal scoring. The Dark Ranger will feel better when we can expect some level of consistency. No one can expect a win every game, but that consistency should come in the form of leadership -and only Jags can speak to that. 1) Just one of those oddities how certain teams seem to always play their best against another. 2) Jagr sees to be baffled on how to play against Witt. Seems not too long ago that JJ feasted on the Isle's defense. Teddy is a good coach -- and for the last two seasons, what appears to be a joke roster in the pre-season is coached into a threatening team for all. Nolen delivers a consistent team system - and the players believe in him. Not sure if Renney has Jags ear, though. We fall into old habits. No complaints being first in the division and should be able to maintain competitive, but if you saw the game last night you would have watched the Rangers that opened the season. Scary. The King just rocks. Great having him on both my fantasy team and real team. Maybe playing them again next week will turn things around...The Island Curse! i didn't watch the game but the media portrayed jagr as a positive factor in the game. though i do know that lazy jagr you are talking about like he has some other place to be than the ice. we're in first place, dark!!!!! who knew?